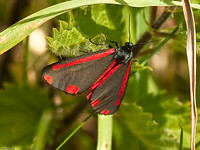 As mentioned previously, Butterflies and Moths share the same Order (Lepidoptera). Describing the differences is not straight foreward. Despite the difficulty in separation, the following families within Lepidoptera are considered to be moths. Note 1: The family classifications are far too numerous for this site. Instead, a large numbers of families will be grouped together. This is a large collection of moth families which, as the generic name implies, are very small. Most species have at least partially metallic patterns coloration and are diurnal, sometimes swarming around the tips of branches with an undulating flight. Others are crepuscular and have a drab coloration. Fairy longhorn moths have a wingspan of 4-28 millimeters, and males often have especially long antennae, 1-3 times as long as the forewing. A large (about 11000 species worldwide) and diverse family of moths. Groups of moths in this family are Tiger Moths, Footman Moths and Lichen Moths. The Larvae of most of the species in this family are covered in hair and have protective chemicals to ward of attack.. Some sub families of Crambidae fold their wings tightly to the sides of their bodies making them inconspicuous on grass stems. Others are colourful and hold their wings in a wide spread manner. The Larvae are typically stem borers in plants of the grass family. Some commercial crops also belong to the grass family which potentially makes some larvae a pest. This family contains about 12000 species world-wide. They are generally slender bodied with large wings. Most fold there wings across the body when at rest but some hold their wings upright like a butterfly. 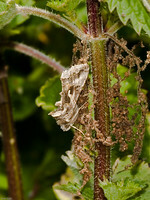 The Larvae are hairless or have few hairs and have only two pairs of prolegs. Movement is achieved by looping the body between prolegs and tail. 25000 species world-wide. 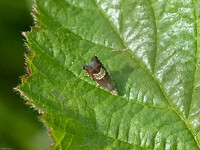 A stoutly built moth with sombre coloured forewings but some have vivid hindwings. The wings may be held roof-like or flat when at rest. Larvae are usually plump and most have little hair. 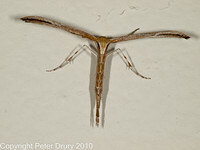 The forewings of plume moths usually consist of two curved spars with more or less bedraggled bristles trailing behind. This resembles the closely related Alucitidae (many-plumed moths) at first glance, but the latter have a greater number of symmetrical plumes. The hindwings are similarly constructed, but have three spars. A few genera have normal lepidopteran wings. The usual resting posture is with the wings extended laterally and narrowly rolled up. Often they resemble a piece of dried grass, and may pass unnoticed by potential predators even when resting in exposed situations in daylight. Some species have larvae which are stem- or root-borers while others are leaf-browsers. Tortricidae is considered to be the single most important family of insects that feed on apple, both economically and in diversity of feeding found on fruit, buds, leaves and shoots. 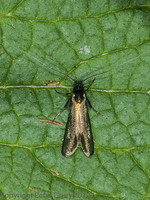 The Codling moth Cydia pomonella is the species which causes worm-holes in apples. It has been accidentally spread from its original range in Europe and is now found in North and South America, South Africa, Australia and New Zealand wherever apples are grown. The majority of this family live in the tropics but some live in the temperate zone. These moths are day flying. They have a distinctively clubbed antenna. 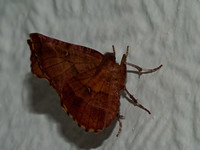 The wings have a metalic sheen and prominent red or yellow spots which warn would be predators that they are distastful.